St Jude's Episcopal Church > The Blog… our journey together > The Blog > God’s presence often shows up in the unexpected. God’s presence often shows up in the unexpected. That’s something I’ve always known. It’s foundational to how I view ministry as an ordained leader in the church. Often when I’m spending time in the office folks drop by and when I happen to be there, they come into the office to chat. More often than not people apologize for interrupting my day. There’s never a reason to apologize! When I’m in the office, I’m there primarily to be interrupted. I discovered shortly after I began my first call at All Saints in Marysville that folks wouldn’t make an appointment to come in and talk. Instead, they would find a reason to drive by the church and happen to see my car parked out front. Many years ago, I heard the statement that “Our vocation is in the interruptions,” referring to the ordained presbyter. That’s always stuck with me. More often than not, God shows up in the unexpected happenings of my day. While we were on vacation in Florida we received a phone call and an e-mail alerting us to an unexpected event. The power to our building was going to be out for three hours one night. We had been looking forward to catching some of the hockey game that night. Instead, we visited a favorite ice cream place. When we returned back to our condo we were treated to a bird’s eye view of what it takes to change out an electricity pole. Very cool! I now find myself looking at how electrical wires are strung on the pole right outside my office window. God showed up in the talents and gifts of those on the ground who made it possible for us to enjoy the fruits of electricity! Possibly because we were in the dark that night the unexpected happened on the beach right outside our home-away-from-home. During the night a Loggerhead Sea Turtle had come ashore. Her tracks were obvious as we awoke the next day. 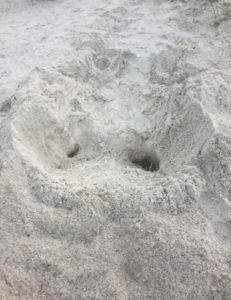 She had made a straight line up towards the dunes and the presence of the Sea Turtle Patrol indicated that she’d made her nest and laid her eggs. Her path back to the water was meandering and interesting I thought. I always love to go talk to the patrol volunteers and that morning I headed down to learn some more. When I got down there the volunteers were beyond excited! Much more so than other years I’ve encountered them at their work. This sea turtle had abandoned her first attempt at a nest. You could clearly see her body cavity and she had dug an egg cave (the hole on the right in the picture below). The smaller hole on the left is her left flipper as she pulled herself out of the body cavity. In speaking with the Sea Turtle Patrol volunteers, I learned that when a sea turtle abandons her nest, she turns around and goes back to the water, not laying her eggs. This turtle had not followed that pattern. She moved deeper into the dune and made a second body cavity, filling her egg cave with her eggs! That was totally unexpected and this reality had brought much excitement from the volunteers! They staked out the actual nest to protect it and to alert beach-walkers to leave it be. The abandoned nest was left open for everyone to see and I was invited to share the story with anyone that was interested. Losing our electricity meant that we had to change our daily routine and ensure that our dinner was cooked before the power went out. It meant that we needed to use the stairs instead of the elevator if we wanted to leave for any time during that window. It meant that our air conditioning wouldn’t work. And it meant that a sea turtle would look towards the shore and slowly pull herself up the beach to lay her eggs. It means that sometime around mid-August over 100 wee tiny Loggerhead Sea Turtles will fight their way to the surface and run as fast as their little flippers will move as they make their way to the sea. And it meant that I would be blessed to learn more about the habits of an endangered species. I believe that God showed up in the midst of all of the unexpected happenings of our vacation! And we were blessed by the surprise! Every other time I’ve seen a Sea Turtle nest it has already been covered up. I’ve never had the experience of seeing a sea turtle body cavity and imaging the painstaking work that the turtle had to engage in, in order to participate with God’s ongoing creation in laying her eggs. I suspect that at some point this summer every one of our schedules is going to unfold in a surprising way. Let’s face it, we are all, every one of us, human and as humans we will at times push back against the unexpected, frustrated that things are happening that were not planned. I wonder what it might be like to look for God in the midst of the unexpected interruptions? When you are able to look back and see God’s presence, I invite you to wander over to our blog “Our Journey Together” on the St. Jude’s website and share your stories. Help us all to see God in unexpected ways!